European Health Law is the most authoritative guide to the subject. Written by leading experts in health law, this book offers an in depth review of the main themes in European health law, from patients’ rights and duties, the role of health professionals, and health care financing and rationing, to public health and health related issues, such as occupational health and environmental health. 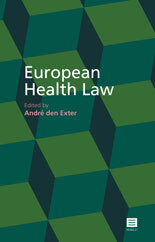 An unparalleled resource for students and practitioners, this is the book you need on European health law. André den Exter [ed.] is a lecturer in Health law and holds the Jean Monnet Chair on European Union health law at the Institute of Health Policy and Management, Erasmus University Rotterdam.